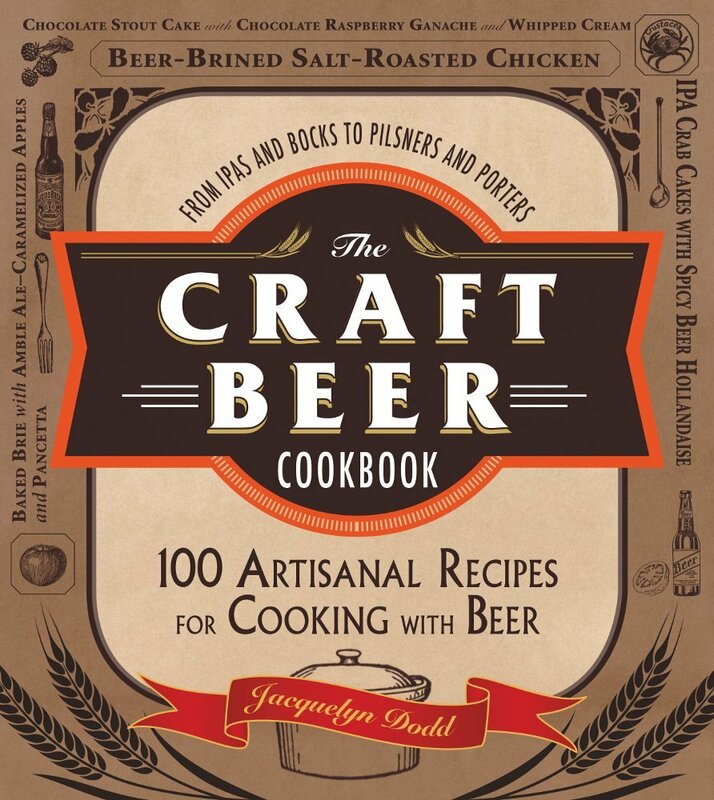 I’m can’t decide what I’m more excited about, the best grilled vegetable recipes I’ve made in years, or this awesome giveaway. Lets talk about this corn for a second. Of course the original purpose of the corn itself was merely as a vehicle for the Sriracha butter, which I adapted from The Sriracha Cookbook (you should buy it, and the Veggie Lovers version), but the sweetness of the grilled corn with the spicy butter made me forget that I had acctually made other things for dinner. This is a meal all by itself. I would also recommend serving it American State Fair style in bed of aluminum foil so that you don’t miss all that fabulous butter that will melt away. And don’t be shy about adding it to your other grilled foods, shrimp and zucchini would love to take a dip in this stuff. Give them a visit, enter to win and GOOD LUCK! And if you don’t win, you can always console yourself with some tasty, spicy, grilled corn. Place butter in a stand mixer with a paddle attachment (or a small food processor) along with garlic, scallions and sriracha. Process until all ingredients are well combined. Scrape onto a sheet of plastic wrap. Roll into a log shape, refridgerate until chilled and firm, about 1 hour. Can be made up to 3 days in advance. Remove the husks and the silk from the corn, leave stalk on, if still attached. Rub corn with olive oil, salt and pepper all sides. Cook on a preheated grill for 15-20 minutes, rotating every 3-5 minutes. 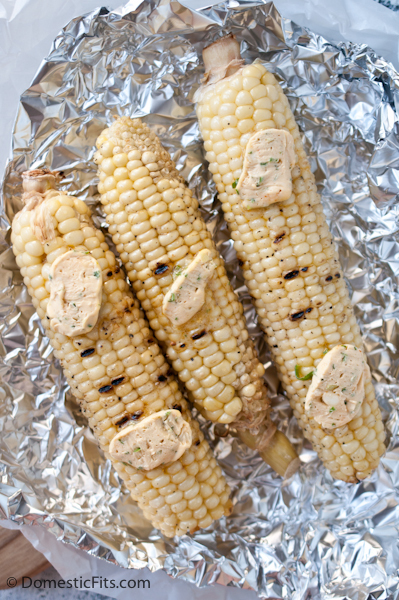 Place grilled corn on a sheet of aluminum foil, top with a few slices of sriracha butter, fold foil around corn. I’m so excited for fresh Summer corn! And this butter sounds insane!!! I gotta get that sriracha book! I will use it like my laptop, but have recipies or cookbooks stored on it so I can have it in the kitchen with me! Since I’m like, the only one I know who doesn’t have an Ipad, I’d use it for EVERYTHING! searching recipes, shopping, photos, games, all the cool apps that I’m dying to try!! Corn season is still a few months away around here, but grilled is our favorite way to cook it so this butter will have to make an appearance at one of the first meals. In the mean time I may just have to try it on some grilled shrimp or how about trout?! I’ve heard about this book!!! Need to get my hands on it, especially if you recommend it. 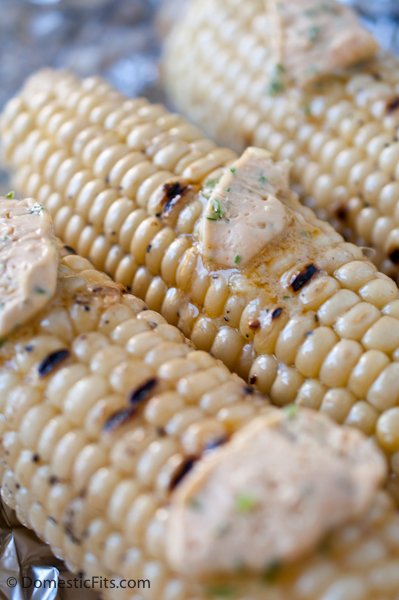 Love this grilled corn idea! We are eating so much of it this season! I am always looking for new ways to make corn even more delicious! iPad in the kitchen is so handy for pulling up recipes, listening to music while I cook! 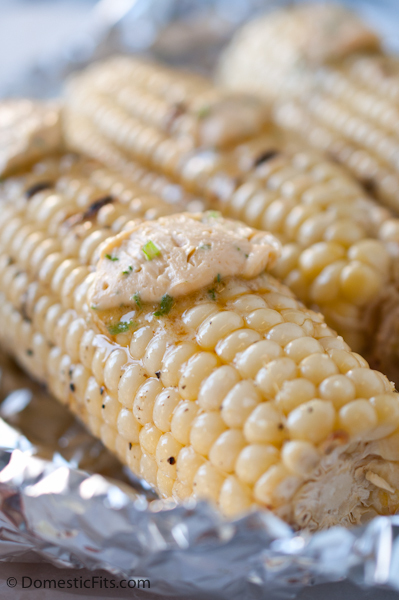 Grilled corn…yum! I would use it for everything!! I would love an iPad to use while traveling for work! I will take my phone back from my 8 year old so he can play Minecraft on the Ipad! I’d use it to read great recipes like the one you just posted. 😉 No, but seriously, I’d use it for everything. I’d love to have a bigger screen than my iPhone to read recipes from while cooking in the kitchen. This corn sounds delicious! I would use an iPad for everything! My daughter would love that Sriracha & Scallion butter – I’m definitely making it this summer! I would use the iPad for everything from viewing recipes, to pinterest to email and facebook etc.. I would use a new iPad to find new recipes and use Pinterest! I’d use it for everything! Great recipe and perfect for summer! DDDUDEE!! This corn! I’m dead. I’ve never been sure how to spice up the typical corn on the cob but this looks delicious! I’d use a new iPad to keep permanently in the kitchen. I’m sick of sharing mine with the toddler! I will use it to download some apps I’ve been wanting; thanks! You know how I feel about Sriracha…combined with butter AND corn? I’m all in! I think I finally found a way to make my boyfriend eat a vegetable! Thanks for the great idea! I’d read all my favorite books and use the apps to help me cook. I would use the iPad to look up recipes for dinner, because every wife know that it is a difficult task to think of something to make for dinner. I love to use chicken , so I need many different recipes. SRIRACHA BUTTER?! My life has changed for ever. When you move near me (fingers crossed!) I’ll buy an ice cream maker, make us some ice cream and then you make us this and all will be right with the world. I bought the Sriracha Cookbook on my Kindle a few months ago and to my discredit I haven’t made anything from it yet! I have to get on this, I’m just about drooling on my keyboard. Corn Shriacha what a great combo. I love anything hot! Corn in the summer a must have. 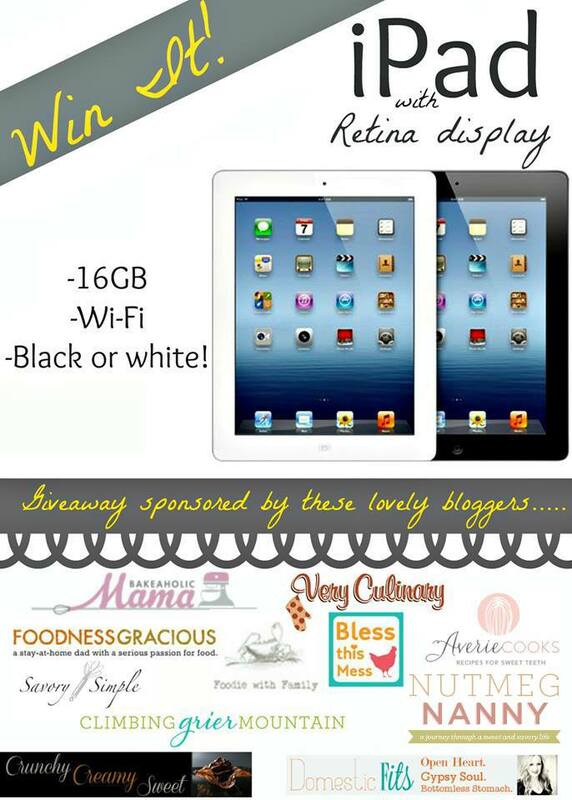 Would love to win the IPad just to have my recipes on hand all the time no more paper printouts! My fiancé LOVES siracha! I bet he will die when summer corn goes on sale, and I whip this recipe up for him! This sounds so YUMMY! I plan to make it July 4th weekend. Thanks for sharing. I think I will use the IPAD to search for workout routines, after trying all these fabulous dishes!! That butter!! Oh my gosh! I love this! That looks amazing. Ready for fresh corn! My main use for an iPad would be for school. After being married and having 4 kids I’m finally going to college to get a degree! This corn looks amazing! I’m such a sucker for fresh sweet corn. I cannot wait till the good stuff starts rolling into the farmer market….yum! I would use the ipad for reading and to download educational apps for my toddler. I’m kind of in love with that sriracha butter! So many uses for the iPad but reading food blogs and getting recipes is a major one! Love this butter, going to make some as soon as the fresh corn is in around here in a few weeks! To start off for this was the best corn i’ve ever made, but you’re going to need some GOOD sweet corn on the cob is the key.